Eating well will not only give you the body you want, it is actually very important for your physical and mental health. The brain, just like any other organ, needs nutrients and minerals to keep the grey matter as healthy as possible. The following are some of the best foods you can provide your brain with. The most effective omega-3 fats occur naturally in oily fish as EPA and DHA, which are good for healthy brain function, the heart, joints and general wellbeing. They improve or delay short term memory loss. They are packed with lycopene, a powerful antioxidant that protects against the kind of free radical damage to cells which occurs in the development of dementia. They are packed with zinc, which are vital for enhancing memory and thinking skills. They are a great source of vitamin K, which is known to enhance cognitive function and improve brainpower. They have had a long reputation of improving the memory. They are packed with vitamin E, which helps to prevent cognitive decline, particularly in the elderly. This article from Positive Med is excellent – but it missed one food that has a very very positive impact on brain function. It is also easy to incorporate into any diet. Coconut (My addition). Coconut Oil, Milk, and Meat are a powerhouse for our brains. 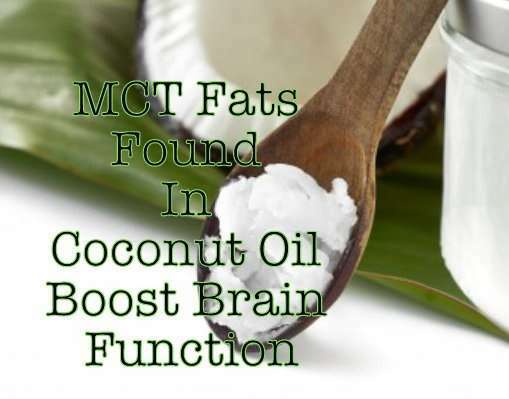 Just one dose of coconut oil can tremendously boost brain function and cognitive performance. Couple the recent media predictions of a pandemic-proportion flu season with talk of more vaccination shortages, and the spread of panic isn’t far behind. However, the flu does not have to be inevitable for you or your family and can be avoided naturally by strengthening your immune system. Certain foods can give you an extra boost and should be factored into your regular eating habits. Garlic is known for its antibacterial, antiviral and antifungal properties and can prevent infections from taking hold and spreading. A daily serving of two raw garlic cloves will provide you with the bulbous herb’s healthy benefits. Tip: To avoid offensive garlic breath, cut the cloves into smaller pieces and then swallow them with water or herbal tea. Follow with a sprig of parsley. Mushrooms have been found to increase production and activity of white blood cells, improving your chances of fighting off infection. Both shiitake and maitake mushrooms provide the biggest immunity boost. Jump-start your immune system each morning with a fresh pot of black tea. While the healthy properties in black tea have been known for centuries, a recent Harvard University study confirmed its healing effects. The study found that people who drank five cups of black tea a day for two weeks had 10 times higher levels of the cold- and virus-fighting chemical interferon than those who did not drink tea. Researchers suspect that green tea has the same effect. Exercising for 30 to 60 minutes daily can give your immune system the extra kick that it needs. A study conducted by David Nieman at Appalachian State University found that people who walked regularly for 12 weeks had half the number of colds and sore throats as people who were less active. Exercise is also a great way to reduce stress and its harmful effects on the immune system. It has been estimated that 90 percent of illness and disease is stress related. But don’t overdo it! Too much exercise can have the opposite effect on your immune system. Exercising for more than 90 minutes a day could make you more susceptible to the flu virus. Getting a good night’s sleep is essential for the immune system to recharge itself. An overly fatigued body doesn’t have the necessary strength to fight off infections. With eight hours a night of solid sleep, your body will be ready to face a new day and ward off pesky invaders. A strong immune system should be able to combat the flu virus, but washing your hands frequently can increase your health odds even more. Use warm water and soap and avoid touching your mouth, nose and eyes to prevent the virus from entering your system. According to Dr. J. Anthony Morris, the former Chief Vaccine Control Officer at the FDA, “There is no evidence that any influenza vaccine, thus far developed, is effective in preventing or mitigating any attack of influenza.” When you also consider the toxic mixture of chemicals found in the flu vaccine, the decision becomes a no-brainer. Among the vaccine’s ingredients are such toxins as ethylene glycol (a.k.a. antifreeze), formaldehyde (a known carcinogen), aluminum (linked to Alzheimer’s disease and known to produce cancer in mice) and thimerosol (a form of mercury, the most toxic of all heavy metals). Thimerosol has had so much scrutiny in the past decade that it has been banned in all childhood vaccinations in the United States, yet it still remains in the influenza vaccine today. This year the flu season doesn’t have to get you down. Take good care of your body and you will be rewarded with a lifetime of good health. And just think of what you can do with all of those unused sick days! Dr. Connealy, M.D., M.P.H. began private practice in 1986. In 1992, she founded South Coast Medical Center for New Medicine, where she serves as Medical Director. Her practice is firmly based in the belief that strictly treating health problems with medications does not find the root cause of the illness. Dr. Connealy writes monthly columns for Coast and OC Health magazines, and is a biweekly guest on Frank Jordan’s “Healthy” radio show. She routinely lectures and educates the public on health issues. Thanks to Natural News for a great article. *** Vitamin C, Freshly squeezed lemon juice in very warm water with honey or Pure Maple Syrup and Cinnamon. I drink this at the first hint of a Cold or Flu with excellent results. Drinking warm lemon every morning is excellent for boosting your immunity and helping your body detox on an ongoing basis. Vitamin B. You’re not crazy – You need your B’s. Thanks to positive med for this article. I am huge supporter of B vitamins, with any chronic illness or pain they are essential, with a lot of stress they can literally change your life. Because I have Fibromyalgia I take 2 Super B Complex every morning, I know many people who wear a B patch, get injections, and take supplements. I just gave my Dilly half of my bottle so she would start taking them; with a house, a husband, a toddler, a puppy, and the recent death of her mother that girl needs some stress relief! This poster lists all the benefits for you. This article and poster really spell out the importance of B Vitamins. I myself have found that a good vitamin mineral complex combined with a good fatty acid blend is essential to being your mental best. Life gets stressful – anxiety levels increase – quality sleep becomes difficult. We all experience this at some point. I had 3 small children, one with severe ADHD an extremely intense job and hubby worked away for weeks at a time. There were never enough hours in a day. I thought I was going crazy. I got myself to a doctor and he wrote a prescription for Prozac. I had researched it for a friend previously so I knew how bad it was.I never filled that prescription but I did go see a call a naturopath and he recommended a very comprehensive vitamin mineral supplement, a good fatty acid blend and Evening Primrose Oil. As it is the best I have found – there is a link at the bottom of the page where you can go to order so you can have it too. Wander around that website – the doctor who put this all together has also provided some other really good supplements that I like to recommend. They cover a multitude of solutions for problems that are very common place in North America today, Nutrition -Constipation – Weight Loss/Weight Management – Menopause – Immunity – Detoxification – Parasite Cleanse. Check out the celebrity fans for the fun of it – None of them are paid a penny. From what I understand there are quite a number of even bigger names on board as well. Just take a look at the ingredients – they will blow your socks off. • All this in just one ounce a day! • Listed in the Canadian Compendium Of Pharmaceuticals and Specialties (CPS)! Here is the actual is exactly what my husband and I are getting as nutritional support from Daily Complete every day. I know it makes every day a better day and I am saving a fortune and not filling up my cupboards with tons of vitamin bottles like i used too. (30 mL) per day during or after a meal. NUTRIENT COMPLEX: Calcium (Gluconate) (28mg), Magnesium (Gluconate) (6mg), Dimethylglycine (3mg). ORGANIC FRUIT AND ORGANIC VEGETABLE PHYTONUTRIENT COMPLEX WHOLE JUICE: Whole Juice Concentrates: organic apricot, organic mango, organic apple, organic tangerine, organic cranberry, organic lime, organic beets, organic green bell peppers and organic parsley; Carotenoid Concentrate: organic carrot, organic peach, organic yellow squash, organic cantaloupe, organic red pepper and organic tomato; Flavonoid Concentrate: organic orange, organic lemon, organic celery, organic grapefruit; organic phenolic red grape, organic strawberry, organic cherry, organic pear; Cruciferous Concentrate: organic broccoli, organic cabbage, organic cauliflower, organic brussel sprouts, organic mustard greens; Lutein concentrate: organic spinach, organic kale, organic asparagus, organic alfalfa, Hyaluronic acid (potato). ORGANIC MEDITERRANEAN SUPER SEED BLEND: Organic Anise Seed, Organic Basil Leaf, Organic Bay Leaf, Organic Caraway Seed, Organic Cardamom Seed, Organic Coriander Leaf, Organic Cumin Seed, Organic Fennel (seed), Organic Fenugreek (seed), Organic Mustard Seed, Organic Oregano Leaf, Organic Sage Leaf, Organic Thyme Leaf. ESSENTIAL FATTY ACID COMPLEX: Glycerin, Sorbitol Fatty Acid Esters, Flaxseed Oil (source of omega 3 fatty acids), Borage Oil, and Evening Primrose Oil (sources of GLA), Almond Oil, Sesame Seed Oil, Coconut Oil, Olive Oil. MEDITERRANEAN HERBAL COMBINATION with ALOE VERA LEAF: Macca (Lepidium Meyenii), Eleuthero Root (Eleutherococcus senticosus), Many-flower Solomon’s Seal (Polygonatum multiflorum) (seed), False Unicorn (root), Black Cumin Seed (Nigella sativa), Yerba Maté Leaves Ext. (Ilex paraguariensis), Astragalus Root (Astragalus membranaceus), Nettle Herbs (leaf) (Urtica dioica), Calendula (leaf), Echinacea Root (Echinacea angustifolia), Alfalfa Leaves (Medicago sativa), Dandelion Root (Taraxacum off. ), Clove (Syzygium aromaticum), Saw Palmetto Berries (Serenoa serrulata), Red Clover Flower (Trifolium pratense), Peppermint Leaves (Mentha piperita), Pumpkin (Cucrbita pepo) (seed), Cinnamon Bark (Cinnamomum cassia), Ginger Root (Zingiber off. ), Licorice (Glycyrrhiza glabra) (root), Ginseng Root (Panax ginseng), Chicory (Cichorium intybus) (root), Lemon Balm (Melissa officinalis) (leaf), Bilberry (Vaccinium myrtillus) (fruit), Goldenseal (Hydrastis Canadensis), Ashwaghanda (Withania somnifera) (root), Artichoke (Cynara scolymus) (leaf), Helonias Root (Chamaelirium luteum), Horehound (Marrubium Vulgare), Passion Flower (Passiflora Incarta), Sarsaparilla (Smilax officinalis) (leaf), Olive (Olea europaea) (leaf), Aloe Vera (Aloe Barbadensis) Concentrate (200:1) (leaf), Iceland Moss (Centraria islandica). HERBAL VITAMIN C COMPLEX: Rose Hips, Acerola Cherry, Sago Palm, Camu Fruit. BOTANICAL COMPLEX with PHENALGIN™: Green tea polyphenols, grape seed extract, Pine bark extract, grape skin extract, phlorotannin extract of Canary Island Cystoseira (canariensis marine algae), Alpine Tea (Rhodenol) (Rhododendron caucasicum), Citrus Bioflavonoids. WHOLE SUPERFOOD GREEN COMPLEX: Wheat Grass (leaf), Barley Grass (leaf), Spirulina (whole plant), Dunaliella (whole plant), Apple (pectin), Barley (sprouts), Brown Rice Bran, Nova Scotia Dulse, Fructooligosaccharides, Chlorella (whole plant), Oat Straw (leaf), Rye Grass (leaf), Lycopene (from tomatoes). PLANT ENZYME CONCENTRATE: Papaya (fruit), pineapple (fruit), amylase, cellulase, invertase, lactase, lipase, phytase, and protease. PROPRIETARY OCEAN NUTRIENT COMPLEX with PLANKTON: Sea Lettuce [ulva lactuca], Wild Atlantic Nori [Porphyra umbilicalis], Dulse (whole plant), Bladderwrack (whole plant), Rockweed (whole leaf), Kelp (whole plant), and Irish Moss (whole plant), Plankton (from golden brown algae). Other Ingredients: Filtered Water, Natural colours and flavours, Glycine, Yellow Pea Protein, Xanthane Gum (naturally sourced), Potassium Sorbate. 194 vitamins, minerals & nutrients in just one ounce, great orange taste! Here the link to a Clinical Study on Daily Complete – The results are terrific. A Dozen Reasons to Eat Eggs – A Natural GOOD FOR YOU Food! A quick note from the poster. In my research, I have found eggs to be one of natures greatest gifts. Do not be afraid to make them a much larger part of your diet. Soon you will be seeing a number of papers indicating blood cholesterol levels are in no way related to heart disease and are not a predictor of heart disease. Blood cholesterol is in fact an indication of what you have eaten in the past 72 hours that has not been used or eliminated from the body. The same researchers will be recommending the use of far more natural fats such as coconut oil and eggs as the body uses what it needs and far more readily eliminates the excess taking with it accumulated toxins. Good Cholesterol/ Bad Cholesterol ratios are very important indicators about your current diet so do pay attention. Plaque formation in the blood vessels is a result of injury or insult usually as a result of inflammation caused by white refined sugars and flours in our diets. Plaque is the band-aid your body applies to the injured area. Our bodies and brains could not function without good cholesterol and actually function far better when supplied with natural unprocessed fats. 100 years ago heart disease was almost non-existent. Processed foods were also almost non-existent. Personally. I try to but farm fresh eggs from free range chickens – they are even more nutritious!